Alders Ledge: What Could You Give Up? How Much Can You Sacrifice To Save A Life? Imagine how you would feel if your home was nothing more than a cheap fabric tent. Or imagine if all you had over your head was a straw roof a scrap of nylon to sit on. If it was sunny and hot you might not feel as bad as the 17,000 Rohingya being forced to live on the beaches of Myanmar feel. They are living in tents and grass huts as the Burmese military and Nasaka prevent them from leaving. The rain is about to start pouring down upon them. The winds are about to start cutting through them like knives. A cyclone is barreling down upon them. So take a moment and imagine yourself in their place. 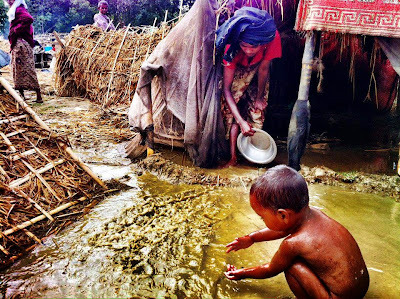 For nearly a year now the government of Burma has been killing Rohingya and burning their villages. 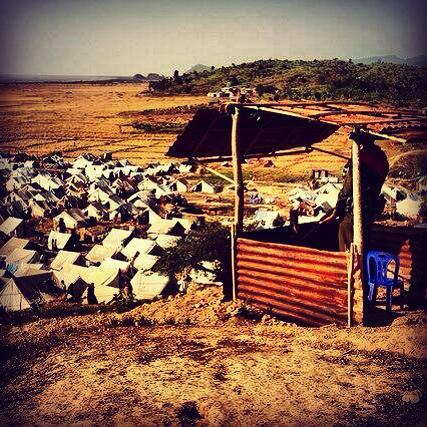 Myanmar has been forcing Rohingya into camps and turning the villages they leave standing into ghettos. The world has stood silently by as the Rohingya have been tortured, victimized, and butchered. The UN has done nothing to stop the genocide. The West has remained idle as the leaders of Burma have been rewarded for their crimes. Now mother nature is sending a cyclone toward the very beaches that the Rohingya are being forced out onto. The storm surge, winds, and seemingly endless rains all threaten the lives of these helpless Rohingya. This is a tragedy that has been well predicted. News and weather sources have plotted out the path of this storm for weeks now. Activist across the world have been sounding the alarm. And sources on the ground (in particular Aung Aung on Twitter: @aungaungsittwe) have been telling the world just how bad things really are. So why are we once again just sitting back and watching yet another disaster play itself out? Why are we watching yet more Rohingya be killed by easily preventable causes? Where is the outcry? I have personally been asking people to donate from the moment I heard about the cyclone. Again and again I have heard countless excuses. And yes, I know the economy is rough. I know that we all have bills that can't wait. But I also know that we all have things in our day to day life that we can go without. For many this could be as little as a cup of coffee from Starbucks or that coke you start your day with. We have lunch and dinner out at a restaurant when we could have packed our lunch or cooked our own food. Maybe it is that next movie or entertainment event you have planned this month. You might even be able to skip the snack foods on your groceries this month. Whatever it might be we all can find a little something to sacrifice to give a little extra this month. Our donations can help organizations, such as Partners Relief and Development, stay in the field longer and do more with the resources our cash can provide. With our little sacrifices we can help bring relief to a hurting and oppressed people. So imagine yourself trapped on that beach with the rain starting. Imagine the winds as they pick up and the sounds of the sea grow more and more angry. Look out at your family, your children, as you hear the waves start to crash into the sand just yards from your tent. See the water begin to rise as you try desperately to push it out of your hut. Listen to the sounds of children all around you as they cry out in fear. Now ask yourself just what you would give to leave that beach and rush off to safety. You can help save the lives of those trapped in harms way. Your donations can go toward helping those who survive this horrific tragedy. But none of that can happen till you dig deep and sacrifice a little. Follow the links below and find it in yourself to help those who can't help themselves. Donate through +Jamila Hanan fundraising campaign.